The fourth annual Global Leadership Summit will be held on Friday, March 15th, 2019 from 8:30 am - 3:30 pm at the McCormick Place convention center, Chicago, IL. This event is hosted by ASCD and GlobalEd Events. Design creative ways to advocate and implement global learning initiatives. This professional learning event includes thought-provoking practitioner and expert panelists, student speakers, and an interactive design thinking challenge on "How can schools cultivate a culture of changemaking?" Participants will walk away with resources and action steps for bringing your ideas to life in your classroom, school, district, or organization. Lunch is included. The opening keynote speaker is Terry Godwaldt, Executive Director, The Centre for Global Education. More information on our featured speakers is below. 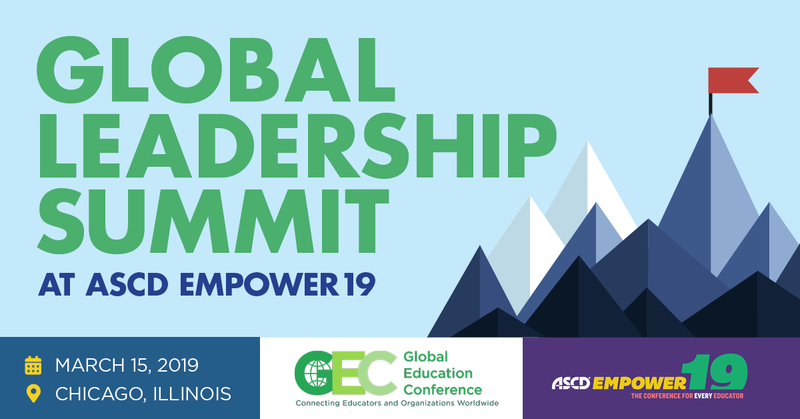 The Global Leadership Summit is a pre-conference special event at ASCD’s Empower19: The Conference for Every Educator and part of the Global Education Conference Network’s fourth annual Global Leadership Week. To register and to for additional information on the program and speakers, visit http://www.ascd.org/conferences/global-leadership-summit.aspx. Space is limited--this event sold out last year, and it's currently the number one pre-registered event for ASCD Empower19. Register today to reserve your spot! 1:00 – Design Challenge: Go through the steps of design thinking to answer the question: How can schools cultivate a culture of change-making? Walk away with resources and action steps for bringing your ideas to life in your classroom, school, district, or organization. Terry Godwaldt, founder and executive director of the Centre for Global Education, is passionate about making a *global* education a *normal* education. From Singapore to Seattle, Australia to Alberta, Godwaldt helps educators integrate authentic, globally minded learning experiences into their classrooms. These experiences empower students to see themselves as global citizens addressing the world’s most challenge questions. For his work in reshaping the classroom, Godwaldt has received the Queen Elizabeth II Diamond Jubilee award and the ASCD award for Innovative Teaching. Dana Mortenson is the co-founder and chief executive officer of World Savvy, a national education nonprofit working to educate and engage youth as responsible global citizens. World Savvy supports change agents in K–12 education to create more inclusive, adaptive schools that ensure all young people can develop the skills and dispositions they need to thrive in a more diverse, interconnected world. World Savvy programs provide support at three critical levels to deeply integrate global competence into teaching, learning, and culture: student engagement, teacher capacity, and school and district leadership support. Since 2002, Mortenson has led the organization through significant national expansion, reaching more than 655,000 middle and high school youth and 4,500 educators across 25 states and 5 countries, from offices based in Minneapolis, San Francisco, and New York. She is an Ashoka Fellow, was named one of The New Leaders Council’s 40 Under 40 Progressive American Leaders, and was winner of the Tides Foundation’s Jane Bagley Lehman award for excellence in public advocacy in 2014. She is a frequent speaker on global education and social entrepreneurship at high profile convenings, including Harvard University School of Education; 21st Century Schools Consortium; Nebraska Global Education Consortium; TABS/NAIS Global Symposium; TEDx Fargo; the Ashoka Future Forum; the Latin America Changemaker Education Summit in Bogota, Colombia; and SXSWedu. World Savvy’s work has been featured in The New York Times, on Edutopia, and on a range of local and national media outlets covering education and innovation. Lucy Gray is the co-founder of the Global Education Conference Network, a 27,000 member community of practice focused on connecting educators and organizations around the world. Gray previously taught elementary grade levels in Chicago Public Schools and middle school computer science at the University of Chicago Laboratory Schools. She also has worked at the University of Chicago’s Urban Education Institute and the Center for Elementary Mathematics and Science Education and currently serves as the director of educational technology at North Shore Country Day School. Gray is an educational innovation consultant working with schools, organizations, and corporations. In her consulting life, she has led CoSN’s Leadership for Mobile Learning initiative, developed strategic plans and content for companies, provided professional Gray is the recipient of ISTE’s Making It Happen award and the Apple Distinguished Educator and Google Certified Innovator distinctions. Mohamed Abdel-Kader is executive director of the Stevens Initiative at the Aspen Institute. He previously served in the administration of President Barack Obama as Deputy Assistant Secretary for International and Foreign Language Education at the U.S. Department of Education. In that role, Abdel-Kader was responsible for encouraging and promoting the study of foreign languages and the study other countries’ cultures at the elementary, secondary, and postsecondary levels in the United States. Prior to his government service, Abdel-Kader held roles at Georgetown University and George Mason University and has advised a variety of clients on organizational strategy, doing business in emerging markets, intercultural communication, and cultural competency in international philanthropy. Abdel-Kader is a trustee of the Longview Foundation for International Education & World Affairs. Seth Brady has been an educator at Naperville Central High School in Illinois since 2004. His course load typically includes sections on comparative religions, world cultures, sociology, and capstone. In 2013, Brady was named a Teachers for Global Classrooms Fellow by the U.S. Department of State and studied religion and culture in Indonesia. This fellowship led to the creation of Illinois Global Scholar, a statewide global education certificate that awards merit on the state transcript to high school students who demonstrate global competence. Brady is an author of the Religious Studies Supplement to the C3, a finalist for Illinois State Teacher of the Year, and winner of the Dream Big Teacher Challenge. He lives in Naperville with his wife, Allison, and their three school-age children. Panelist, Discussion 2: "Enacting Systems-Level Change to Support Global Learning"
Helga Fasciano is the owner of HKF Consulting. She is retired from the North Carolina Department of Public Instruction, she most recently served as the special assistant of global education. Some of her accomplishments included implementing the North Carolina State Board of Education Global Education Action Items: the Global Educator Digital Badge, the Global-Ready Schools and District Implementation Rubrics and Designation Application, and Dual Language/Immersion Program Expansion. Fasciano is experienced in education management for federal grants and programs at state education agencies, including Title III, ESL, world languages, standards, and curriculum & instruction. Matt Nink is the founding executive director for both the Stuart Center for Global Leadership at Lake Forest Academy in Lake Forest, Illinois, and the Global Youth Leadership Institute (GYLI) in Milwaukee, Wisconsin. He also has 20 years of experience as an award-winning English teacher and administrator at four high schools in Wisconsin and Illinois. Among his achievements, Nink has developed and improved leadership, diversity, service, and retreat programs for students and teachers. He has created engaging curriculum and measurement tools that have received national attention for GYLI’s four pillars: collaborative leadership, multicultural identity, religious pluralism and environmental sustainability. He has conducted successful student and faculty workshops at K–12 schools and universities throughout the United States, as well as in Costa Rica, the Dominican Republic, India, Nigeria, and Panama. He has presented at many conferences in North America, Asia, and Europe. Panelist, Discussion 1: "Leading from the Classroom: Inspiring Students as Global Change Agents"
Jim Reese is the founding director of the Professional Development Collaborative at Washington International School in Washington, D.C. The PD Collaborative provides opportunities for area educators to deepen and broaden their capacity to inspire deep thinking in learners, educate for global competence, and share best practices with the community at large. A long-time consultant with Project Zero, a research group at Harvard University's Graduate School of Education, Reese supports a number of initiatives that focus on global competence. He earned a doctorate degree in curriculum and instruction from George Washington University. Jessica Stovall is a doctoral student in the Graduate School of Education at Stanford. She studies Race, Inequality, and Language in Education (RILE), and she is working to interrupt systemic racial achievement disparities. A recipient of the 2014 Fulbright Distinguished Award in Teaching, Stovall spent a semester in Wellington, New Zealand, studying educational debts between white and indigenous Māori students. Since her return, she has embarked on two projects—a comprehensive teacher professional development program and a workbook for teachers—focused on eliminating the racial predictability of student achievement. Before Stanford, Stovall was an English teacher and instructional coach for 11 years, and she is currently the teacher’s assistant for the Stanford Teacher Education Program (STEP) English Curriculum and Instruction sequence. In her spare time, she serves on the ASCD Global Education Advisory Board and creates professional development programs around equity for school districts. Erin Towns is a 19-year veteran social studies teacher at Edward Little High School in Maine. Fiercely dedicated to global education, she uses professional fellowship experiences in Japan, Kazakhstan, China, Germany, and Ethiopia to help Maine students investigate the world, examine cultural perspectives, and apply knowledge learned to take direct action on global contemporary issues. Students create resources for authentic local, state, national, and international audiences to address social and environmental problems. Towns was recently selected as one of the 2018 National Geographic Teacher Program Fellows for her commitment to geographic and global education. Cleary Vaughan-Lee is the executive director of the Global Oneness Project. She is interested in bringing universal values into educational content, asking local to global questions about culture and the environment. A regular contributor to Education Week, PBS, Share My Lesson, and TED Ed, Cleary documents ways digital storytelling can be used in the classroom, highlighting teacher and student voices. She conducts workshops across the country and presents at regional, national, and international conferences. Kelisa Wing is a professional development specialist with the Department of Defense Education Activity (DoDEA) in Alexandria, VA. She is the 2017 DoDEA State Teacher of the Year, the 2017 UMUC Outstanding Alumnae of the Year, and a 2016 ASCD Emerging Leader. She is the author of Weeds & Seeds: How to Stay Positive in the Midst of Life's Storms and Promises and Possibilities: Dismantling the School to Prison Pipeline. Wing holds a bachelor's degree in English from The University of Maryland University College, a master’s degree in secondary education, and an educational specialist degree with a concentration in curriculum, instruction and educational leadership from the University of Phoenix. She is currently enrolled at Walden University in the doctoral program.